Lost Vape Paranormal & IJoy RDTA 5S Review | Excellent Pair! - Daily Vaping Deals & The Best Vape Product Reviews at Vaping Cheap! Home → Mods → Box Mods → Lost Vape Paranormal & IJoy RDTA 5S Review | Excellent Pair! Lost Vape Paranormal & IJoy RDTA 5S Review | Excellent Pair! In this vape review, we’ll be taking a look at two new products coming from Lost Vape and IJoy. Lost Vape is known for their high quality DNA devices, and this new vape mod utilizes the Evolv DNA75C board, which boasts a ton of features and a gorgeous color display screen. 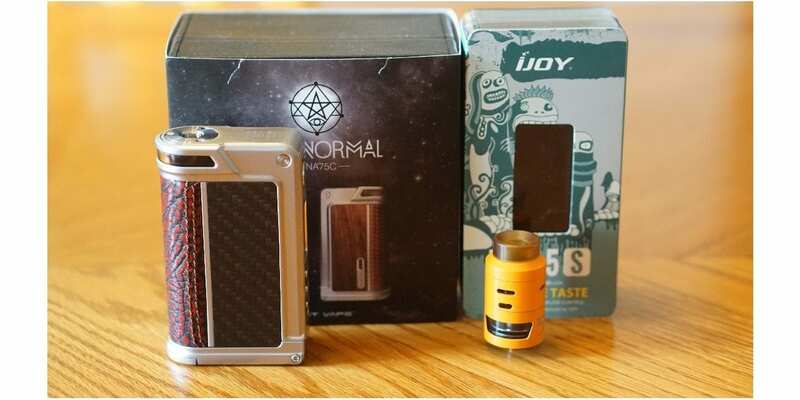 IJoy is also well known, especially when it comes to RDTAs, as their originals were incredibly popular due to their solid performance and affordable pricing. The iJoy RDTA 5S sports a much different design when comparing it to the previous atomizers coming from this company. Before getting any further, we’d like to thank VapeSourcing for sending these two products for the purposes of this review. We’ll go over our first impressions, building and wicking, usage, performance, pros and cons, and conclude with whether or not we recommend them! I’ll start with my first impressions of the Lost Vape Paranormal DNA75C Box Mod. Lost Vape always exceeds my expectations when it comes to packaging, and this one is no different. The packaging for the Paranormal is top notch, and makes it feel like this device costs much more than what it does. The initial packaging which you slide off to reveal the leather-like box has some minimal information on the front and back. Once you open up the box the Paranormal comes in, you’re immediately greeted with it alongside the micro USB cable, which can be used for charging, customizing and upgrading. You do get an additional panel, user manual, warranty card and a suction cup, which is used to change the panels. Everything is presented incredibly well, and if you own a Lost Vape product, then you know exactly what to expect. Once I held the Lost Vape Paranormal in my hands, it felt of great quality, and pretty similar to the Therion, except for a few key differences. For one, it is slightly bigger, but the overall shape kind of remains the same. It is extended on the bottom, which is for the battery door. Unlike the Lost Vape Therion, the Paranormal features a sliding battery door, and it is very secure. This by far is my favorite improvement with this device as I personally did not like the battery door with the Therion since it is known for ripping battery wraps. Another key difference is the material located on the side of the device by the 510 connection. I’m not exactly sure what this material is, but it’s very comfortable and feels slightly squishy. When you’re gripping the device, it just feels more comfortable with the added cushion. Not to mention, it’s overall design it ergonomic, which certainly adds to the comfort. If you’re used to the Therion, then you have a pretty good idea of how this would feel in the hands. Overall, I was certainly impressed by the Lost Vape Paranormal from the packaging to its design. It’s incredibly well made, and I was excited to attach an atomizer and start vaping! The IJoy RDTA 5S comes packaged in the familiar IJoy packaging which we’ve seen with pretty much all of their atomizers. The initial packaging which you slide off to access the plastic box has designs all over with very minimal information. Once you do slide this off, you can clearly see everything that’s included with this atomizer which is IJoy RDTA 5S, a pair of Clapton coils, a spare glass tank section, a spare parts pack (includes o-rings and screws) and a Phillips screwdriver. It’s definitely a pro that IJoy includes all of these extras as it makes it more worth your money in my opinion. The color I did received is Orange, but there’s tons of other colors to choose from such as Black, Stainless Steel, Rainbow and more. Also, this atomizer does have a base diameter of 24mm. At first glance, I immediately noticed the differences of this atomizer when comparing it to the past IJoy rebuildable dripping tank atomizers. This newer version sports a smaller form factor, and just looks different, which is a good thing. I do like the looks and overall design of this one when compared to the others such as the Combo RDTA. The quality of the RDTA 5S is good, and all of the threads are pretty smooth. A pro to be mentioned right away is that this atomizer came clean with no machine oil whatsoever! So once wash with warm water and this RDTA was ready to be built and vaped! All in all, my first impressions of the IJoy RDTA 5S were great. I really liked the design of this atomizer and much preferred its stealthier profile in comparison to some other RDTAs on the market. The IJoy RDTA 5S does feature a velocity styled build deck, so building on this atomizer is very easy. This is still one of my favorite build decks to build on and I do think it’s one of the easier ones to work with as well, especially for the beginners. Some vapers may not like this type of build deck for exotic coils since they can bend your leads, which is understandable. Thankfully the top screws are not sideways like the bottom screws, which means your leads at the top won’t bend or twist. I was able to easily fit a Fused Clapton Coil with zero issues, but I do think some large coils such as Claptons with thicker gauge wires will take some more effort to fit. You can fit relatively large coil builds, but you still have minor limitations. 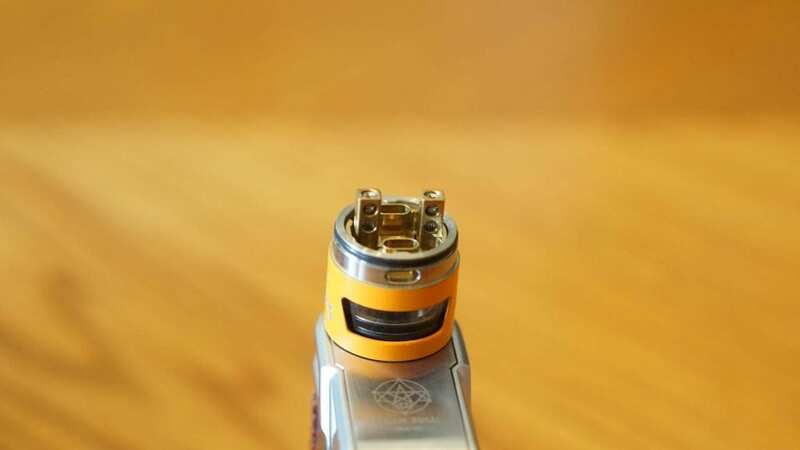 Also, when installing your coil build, be sure that your coils are sitting right on top of the bottom airflow holes, as this will ensure the best flavor. The bottom airflow hole is not massive, so a 5/6 wrap Clapton coil will easily cover the entire distance. Wicking is also very easy with this atomizer since there are wicking channels which are made for your to insert your cotton. Simply cut your cotton to the entire length of wicking channel, fluff out the cotton and then cut off the excess. Afterwards. gently place your cotton into the wicking channels. You do not want to over stuff this wicking channel, so be sure your cotton is able to still “breathe”. When you’re finishing tucking your cotton in, you can cut off any excess cotton that you feel is too long. I found that cutting the cotton right to where the wicking channel ends will give you the best performance. Overall, building and wicking the IJoy RDTA 5S is very easy, and I’m sure beginners and advanced users will have little to no issues with it. This is the first time I’ve seen a wicking channel like this, but I do think RDTAs should adopt this kind of style as it makes wicking incredibly easy. Using the Lost Vape Paranormal DNA75C over the past couple of weeks has been nothing, but a great experience. 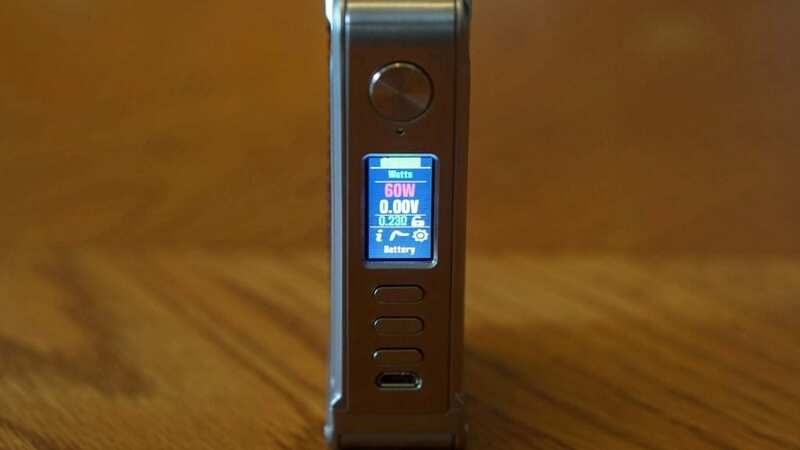 Firstly, this device does require 2 high drain 18650 batteries for operation, and it is powered by the new Evolv DNA75C board. With this board, you’re getting a maximum wattage output of 75w. This may be seen as a con to some vapers, especially the ones who prefers to vape at higher wattages. For me, it wasn’t an issue since I usually vape between 50w and 75w. However, with two 18650 batteries ran in parallel, you can expect really good battery life, more on this later. With the Evolv DNA75C, you do have a large color display screen which makes it very easy to see all of your vaping information such as wattage, voltage output, resistance, mode and more. Also, with this board, you do have your normal fire, wattage up and down buttons, but you also have another button which allows you to select whichever function you have highlighted. For example, if you highlight the “Watts”, you can select it with the middle button which allows you to cycle between the different firing modes such as temperature control for Ni200, Ti, and SS. What’s great about this board in comparison to the other DNA boards is that you can adjust settings on the fly rather than waiting to get home and connect it to your PC and use the EScribe software, which is something you can still do with the DNA75C. You can check the diagnostics, change the screen brightness, adjust the preheat settings, check the puff counter data, and much more. Another great feature is that you can completely customize the look of the display screen, but this one you have to do using the EScribe software. With this board, you can really fine tune your vape experience to really fit your vaping needs which is great. 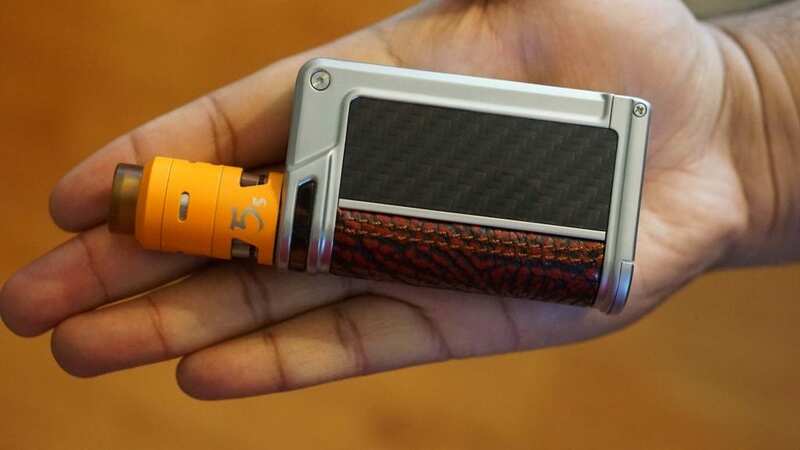 However, I do feel that some beginners may feel overwhelmed with a device like this, but advanced users who like to customize their vape mod will absolutely love the DNA75C. Also, just like the other DNA devices, 1 press of the fire button will turn it on, and five clicks of the fire button will unlock/lock it. You can change the lock settings as well using the EScribe software. It didn’t really take me that long to get used to this device and the new DNA75C board, but I do have a lot of experience dealing with previous Evolv boards. After getting used to it, I became a big fan of the Evolv DNA75C. Now back to the device itself, it’s incredibly comfortable to hold, and fits easily in my pocket. Remember, it is slightly larger than the Therion, but not by much in my opinion. You’ll have no issues carrying this in your bag or purse either. Something else worth mentioning is that atomizers up to 25mm will sit flush with no overhang, which is definitely a pro. Also, all of my atomizers sat flush and made a connection with zero issues. All in all, using the Lost Vape Paranormal has been great! Like mentioned earlier, it may take some time to get used to the board, but after, you’re getting one of the best vape experiences the market has to offer. Starting with the performance of the IJoy RDTA 5S, the performance is great! Firstly, my preferred coil build was a dual Fused Clapton, which had a resistance of 0.23 ohm. I did try other coil builds such as standard Claptons and a simple round wire build, which performed good. However, for my vaping preferences, I did like the Dual Fused Clapton since it provided me with a bit more flavor and warmth. With this coil build, I would vape it between 60w and 75w. Between these wattages, I would get a warm and flavorful vape experience. The flavor was actually better than what I expected, and I would definitely say it’s because of the bottom airflow. While it’s not a massive airflow opening, it does help with the flavor. Speaking about airflow, when both the side and bottom airflow is wide open, there is little restriction and way too much airflow for me. However, you vapers who like wide open airflow will love this. What’s great about this atomizer is that the bottom and side airflow are independently controlled, which means you can adjust each to your preference without disturbing the other airflow. I preferred the bottom airflow wide open, and the side airflow barely open. This provided me with a more restricted draw, and definitely improved the flavor. When both of the airflow options are completely open, the flavor does get muted a bit, but the vapor production improves. So if you like to flavor chase simply close the side airflow, and if you wanted to cloud chase you can either have the side airflow wide open or have both airflow wide open. This is definitely a pro as this atomizer will suit both type of vapers. I do want to mention that the airflow can be a bit noisy though, especially when just having the bottom airflow open. This is not a deal breaker, but still something worth mentioning. Now, a subjective con to be mentioned is that the IJoy RDTA 5S only has a 2.6ml e-liquid capacity. However, filling it is quite easy with its center top fill design. The fill port is located right between the build posts, in the center. Dropper bottles and unicorn bottles work great with this type of fill system, but some other bottles will simply not work well (bottles with the twist top specifically). Also, with this e-liquid capacity, expect to be filling quite often, especially if you’re vaping at higher wattages. A pro to be mentioned is that this atomizer does wick very well. Just be sure your cotton is not packed too tightly in the wicking channel and you’re good to go. Also, this atomizer is compatible with 810 drip tips, and does include an Ultem Wide Bore 810 drip tip which is comfortable to use. Overall, the performance of the IJoy RDTA 5S is solid! I do like the fact that this atomizer can cater to both cloud chasers and flavor chasers. As mentioned earlier, the Paranormal DNA75C Box Mod requires 2 high drain 18650 batteries, and has a parallel configuration. It does have a maximum wattage output of 75w, and it is very accurate, so you know you’re getting a true 75w vape. This device does offer temperature control for various wire materials and does have a few that are already configured such as Ni200, SS316L, SS430, Ti, SS316, and NiFethal 30. There is also a “watts” mode as well for your standard wattage mode. It’s definitely a pro that it comes pre-loaded with all of these configurations, especially all of the popular options such as SS316 and SS316L. Just like the other DNA devices on the market, the temperature control vape experience from this box mod is fantastic and one of the best on the market in my opinion. I did test SS316 and SS316L, and it worked flawlessly. There is a preheat function as well, which is perfect for Stainless Steel Clapton builds. Another great feature, and it is quite important for TC, is that you can lock the resistance of your coil build. In wattage mode, it performs just as you’d expect it would. In addition, there is zero delay when hitting the fire button, which is yet again another pro to be mentioned. The battery life is really good, especially if you’re vaping between 50w and 60w. At 75w you can get all day battery life as well, especially if you’re using 3000 mAh 18650 batteries such as the Samsung 30Q or Sony VTC6. All in all, the performance of the Lost Vape Paranormal DNA75C was excellent! The performance in both temperature control mode and standard wattage mode is flawless. In conclusion, both the Lost Vape Paranormal DNA75C Box Mod and the IJoy RDTA 5S are excellent performing devices, and make an excellent pair! The vape experience from the Lost Vape Paranormal is flawless in both TC mode and standard wattage. In addition, building and wicking the IJoy RDTA 5S is very easy with its velocity styled build deck and wicking channels. Even though these are both great devices, there were cons to each. Firstly, with the Lost Vape Paranormal, I think some newer vapers will find it a bit overwhelming, especially at first. However, it took me no time to really get used to it, and best of all, you can fully customize it using the EScribe software from Evolv. The RDTA 5S from IJoy did have somewhat of a noisy airflow, and the e-liquid capacity may be a con to some vapers. Of course with a more compact design, sacrifices had to be made, but thankfully with its top fill design, it makes filling quick and easy. So, if you’re looking for a solid performing and highly customizeable dual 18650 device and don’t vape primarily over 75w, then the Lost Vape Paranormal DNA75C is something I would highly recommend. The same can be said for the IJoy RDTA 5S if you’re looking for a great performing RDTA with various airflow configurations. We hope you find this review helpful in finding the right box mod or atomizer to fit all of your vaping needs! Feel free to leave any questions or comments down below! Thanks for reading!